When I first saw Jason’s tweet, my reaction was “What?! No Danny Sullivan?” Seriously? After everything he’s done for the SEO community? How can the “father of search engine optimization” not be considered one of the top five SEOs in the world? Just what kind of twisted logic is Calacanis applying to his list? Did Michael Arrington slip a drug into Jason’s drink right before he wrote that tweet? (Given Arrington’s bizarre anti-JCal behavior lately, that’s not entirely outside the realm of possibility. I imagine Arrington has made many the attempt to slip chemicals into Jason‘s drinks through the years…). But getting back on topic, let me see if I have this right. Sullivan has invited Calacanis to sit on panels and give keynotes at conferences, and he still can‘t crack his top five. Good god! It’s harder to break through Jason’s celebratory tweet ceiling than it is to get accepted into Skull and Bones. While I agree wholeheartedly that the five SEOs Jason mentioned are the best in the known universe, I can’t help but wonder what Danny Sullivan’s reaction would be if he stumbled upon a monument dedicated to SEOs based on Jason‘s tweet. I have to imagine he would simply stare up at the thing and sigh, as the above comic demonstrates. What if I told you that I was hell-bent on building a real-life Mount Rushmore for SEOs? Crazy, right? Well, let’s examine the proposition. I estimate that it can be constructed for less than $30,000, provided that I cut every possible corner and pay illegal aliens to build it without going through a middleman. Now, you might be wondering, why would I (or anyone) actually want to build such a sculpture? And the answer is..I don’t know. I’m thinking we can just build it and then figure out why it was built later. Where the Hell Would We Put the Thing? How about right dab in the center of town. The only question is, what town. Hmm…how ’bout Grand Rapids, Michigan? The only thing in the middle of the city is a large river, which makes it ripe for risky and arduous terraforming. Construction will begin at exactly 12:12 a.m. on 12/12/2012. Given this combination of numbers, what could possibly go wrong? On this date, the top five SEOs in the world and Danny Sullivan will be called in to pop a ceremonial bottle of champagne, and from there, the construction workers will be off to the races. They’ll be forced to work for 40 straight hours with no break. But don’t worry; they’ll be wearing spacesuits so they can go to the bathroom in their pants, and if necessary, launch themselves into space to escape the trauma of actually having to build such a monument. Is asking people to work for 40 straight hours a tad extreme? Maybe, but these are extreme times. We’re on a tight self-imposed deadline, and last I checked, giant monuments to celebrate SEOs don’t build themselves. If you’d like to donate toward the statue‘s creation, write a comment below explaining how much you’d like to give. The hope is that by working together, we can build something extraordinary. 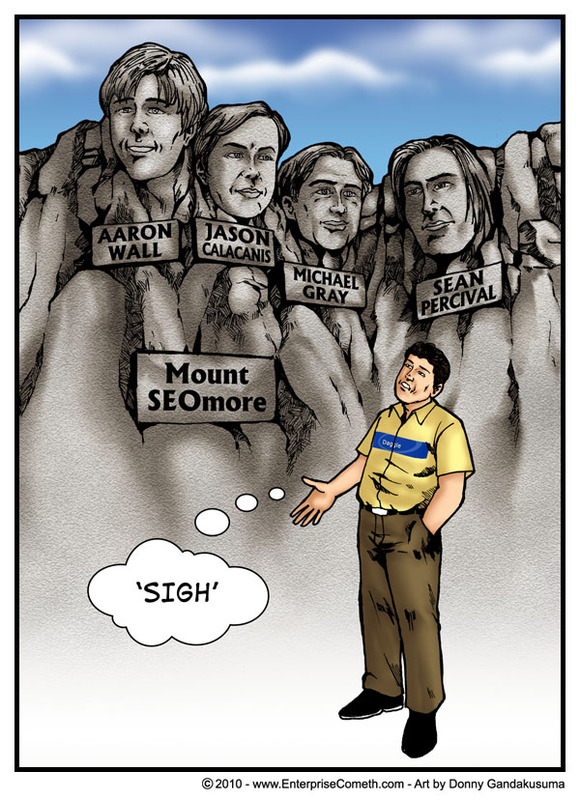 On A Mount Rushmore for SEOs: What, no Danny Sullivan? Thanks for the kind words, Will. I missed Jason’s tweet. But I could see where he or some others might coming from, in making that type of assessment. They might be measuring people against those who are actively doing SEO for clients or for large sites. Jason’s is still kind of strange — Arianna Huffington isn’t doing SEO herself, of course. But she oversees an amazing SEO operation in the HuffPost, so again, I can see the logic. This whole discussion is probably moot anyway because when the money is raised to have this monument created, ten to fifteen SEOs will be included and there should be less debate about who deserves to be on the shrine, in theory anyway. I believe that American tax dollars should be used to create this statue. Seems like a good use of money. Sullivan should be up there before any of them. I’m also sure Danny would tell you that there are ace SEO’s out there ALL DAY LONG that would crush these guys, no offense. Kenneth, when the actual statue is built, Danny will definitely be there. Maybe we should have a statue for each country… I would love to see my face on the South Africa one.